She has a reputation for setting men's hearts aflutter and had worked only with male directors. But Bollywood star Katrina Kaif said working with a woman director - Farah Khan in Tees Maar Khan - has been a nice experience. "I've had wonderful experiences of working with male directors as well, but definitely, it's nice working with a female director. The vibe is different and definitely there is a different way that you would bond or gel with a woman director," said Katrina in an interview. 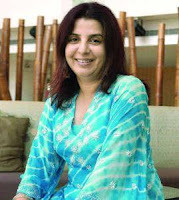 The actress is all praises for Farah, who has given blockbusters like Main Hoon Naa and Om Shanti Om in the past. "She is so clear about what she wants to do and is not a hard taskmaster on the sets at all. She never wastes a minute of your time and will never call you earlier. She is a phenomenal director and I think she is fantastic," she gushed. Releasing Dec 24, Tees Maar Khan, an action-comedy, stars Akshay Kumar opposite Katrina. Akshaye Khanna too has a pivotal role in the film. Throwing light on her role, the 26-year-old said: "I play a wannabe actress in the film, who is a very innocent girl." "She doesn't see any possibility that a person might be doing something wrong or doing something bad. So Akshay is forever running after her to save her from situations that she gets herself into because she is too trusting. "She is very ambitious too, but in a simple way, not in a very intelligent way. It was fun to play this character. I just kind of went with the flow," added Katrina. Her well-toned look has also caught attention, particularly in the item song Shiela ki jawaani, already something of a hit. "It's not that I had to lose weight, it's just that I wanted to set a different kind of target for myself in terms of fitness. Also, the clothes I'm wearing in the song demanded a more toned up look. So that's why I worked towards that," she explained. Doesn't the title of the song sound suggestive? "Lyrics are lyrics. No one should take them literally and seriously and analyse them in songs like these. If you believe that you are doing something clean and keeping yourself in the boundaries of dignity, then the lyrics and mood of the song don't matter and you feel comfortable while performing it," she said. "I enjoy my dancing. I don't know how technically good I am, but I like doing it and I enjoyed it," she added. Speaking about the film's leading man, Katrina said even though she had done a couple of films with Akshay in the past, including Hum Ko Deewana Kar Gaye, Welcome, Namastey London and Singh Is Kinng, audiences will still get to see something new in the movie. "I think it's a new approach that we take in each film. You have never seen me and Akshay in this kind of space and this zone. That is something we always look for because when you do so many films together, it's important that we don't do the same things," she said.